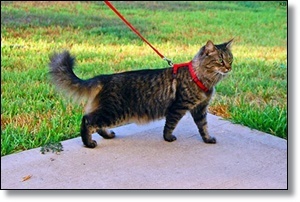 Ever seen a cat out walking on a leash? Most people who have seen one react with astonishment that a cat would be domesticated enough to willingly allow itself to be tethered to a leash and guided around by -- of all things! -- a human companion. But it can, and does happen. After all, why should dogs have all the fun? Everyone knows cats like the outdoors, too. Shouldn’t they get the opportunity to explore the great outdoors along with the rest of us? Shouldn’t they be allowed to maintain their youthful figures with some regular exercise? Learning how to walk a cat may seem impossible, but with proper supervision, patience, and consistency, you too can train your cat to walk on a leash. Once a cat has reached the age when she has been fully vaccinated, it is safe for her to go on walks outside. Remember that this is not so much to protect other animals from what she might be carrying, but to protect her from what they might be carrying. It is best to start as early as possible, before your cat has developed a fear of the outdoors or a fear of unusual noises. Older cats are often more reluctant to go outside on a leash -- or to be on a leash at all. It may take months to get her used to accepting a harness, and to being led, but with diligence and a wish to succeed, you can do it. It will help a lot of your cat is already responsive to you. If you can call your cat and she consistently comes to you, you are already on a good track. If you do not have this type of relationship, you will need to start there. Using treats and lots of praise, call your cat to come to you. After some time, your cat will learn that coming when called will be rewarding. Because cats are so agile, a simple collar around the neck is not enough to hold them while walking outside -- they can easily pull out of the neck collar, even a well fitted one (and you do not want to make the collar so tight that there is a potential of cutting off air flow). Instead, use a good-quality harness that has been designed especially for cats. A cat harness is typically made with an adjustable neck collar, which is attached to an adjustable body wrap. The harness should fit snug to the body, but not be so tight that air flow will be constricted. You should be able to fit two fingers under the harness at the neck and under the chest. Depending on the harness, the leash should attach at the body strap or between the shoulders instead of at the neck. The clips holding the harness should snap securely -- they should not be the break away type that is commonly found in cat collars.